Every Microsoft Word user is familiar with Word’s squiggly red line used to highlight misspellings and how it will suggest correct spellings if you right-click the misspelled word. What many users are not aware of is that Word will assist you to determine whether you are using the correct word or should be using a synonym. This will open the Research Pane with a list of definitions. You can then read through the definitions to see if you are correctly using the word in question. At the bottom of the list are some hyperlinks with other reference sources. If like you find that like you are always like using the same word like in a report you might want to like look for similar words that like have the same meaning, like you know synonyms. 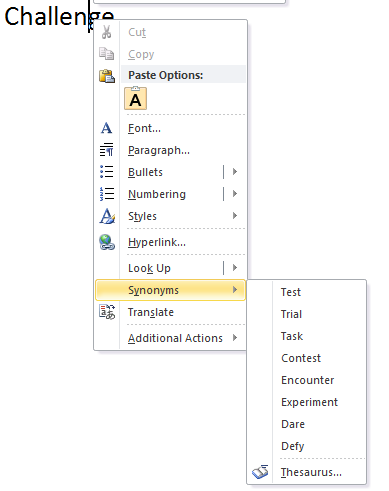 Right-click the word and choose synonyms from the short-cut menu. 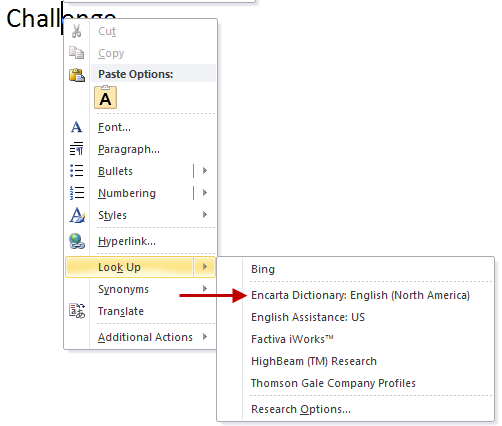 Unlike the previous example, you can either select one of the choices that Word presents, or choose to open the full Thesaurus in the Research Pane. Word will also attempt to translate a word into certain non-English languages by choosing Translate from the right-click short-cut menu. Unfortunately, Latin is not one of the choices. You can also access the Research Pane by clicking on the icon in the Review tab of Word’s ribbon. 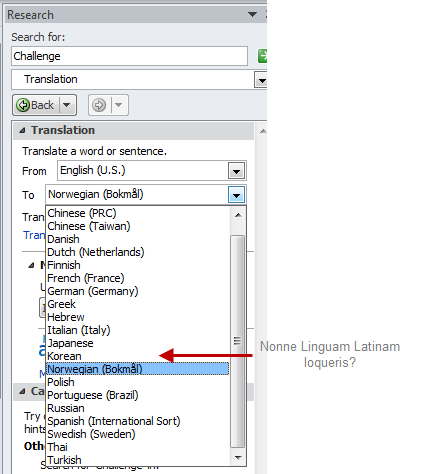 Users of Word 2003 can access the Research Pane by selecting Tools==>Research from the menu bar. Microsoft Word provides six shortcuts for placing specific styled lines across a page. Not only do these lines look better than (for example) holding the equal sign to repeat a double line across the page, but the length of these lines automatically adjust as the page’s left and right margins are changed. To create these lines, move the cursor to a blank line in a Word document, type a specific character three times, and then press the enter key. The following screen shot shows both the special character to type and the resulting line inserted by Word. This tip works in Word 2003, 2007, 2010, and 2013. When reviewing a Microsoft Word document with many pages you may find yourself constantly scrolling up/down or using the Page Up/Page Down keys. To aid in navigating large documents Microsoft added the Navigation Pane starting with Word 2010. The Navigation Pane is only available when a document contains Heading styles. At a minimum a document must utilize the Heading 1 style. 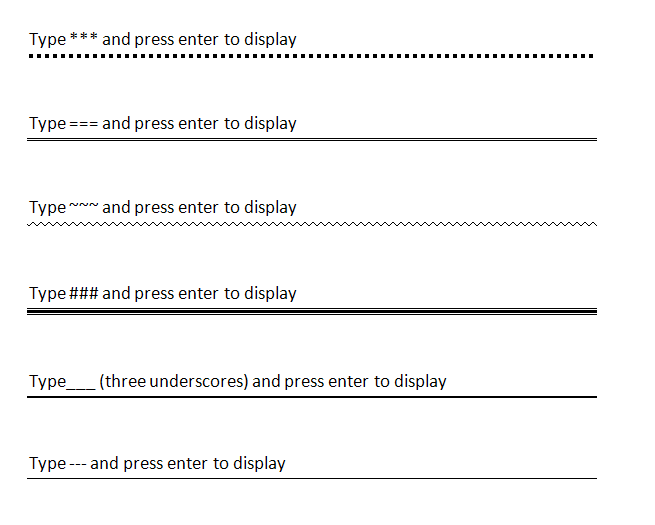 The Navigation Pane will also recognize and use the higher heading styles (2,3,…). To use the Navigation Pane you must ‘turn it on’ by checking the Navigation Pane check box in the Show section of the View tab on the ribbon. One of the ironies of using computer software programs with a graphical interface is that you have to move at least one hand from the keyboard to the mouse in order accomplish some command or task. When using a word processing program most users immediately reach for their mouse to move the insertion point to a new location, or to look at another portion of the document. This is very inefficient considering that you will be moving your hand back to the keyboard to continue typing once you have moved to the new location. This article explains some of the methods to navigate a document with the keyboard when using Microsoft Word. These keyboard shortcuts should work in Word 2003, 2007, 2010, and 2013. NOTE: The ‘+’ between the key names indicates that you have to press the keys at the same time. Even remembering half of these navigation tips will make you more efficient at moving around a Word document. In addition to the regular ways of navigating a Word document with the mouse or keyboard, Microsoft has provided the Browse Object. The Browse Object are the two double-arrows located at the bottom of the vertical scroll bar. These double-arrows move the insertion point to the previous or next instance of a particular object. The default object browsed is Browse By Page. Therefore, these double-arrows move back and forth between pages of the document. What most Word users do not know is that you can change the object being browsed to something other than page. For example, if you changed the Browse Object to Browse by Graphic, the double-arrows would then move the insertion point back and forth between all of the graphic images contained in your document. To change the Browse Object, either click the round button between the double-arrows as shown in the next screen shot, or press ALT+CTRL+HOME on the keyboard. This brings up a small box with twelve icons. The first two icons do not actually modify the Browse Object. They both display the Find and Replace dialog box, although with a different tab having the focus. The remaining icons change the object being browsed to one of the following. To learn which icon handles which object, hover your mouse over the icon. The object type will be displayed above the icons as shown in the next screen shot. The Browse Object can be a tremendous time saver when navigating large, complex documents. The key is to remember that it even exists!